Take a deeper look at your workout. Break down the focus, alignment, and sweat you experience in each SALT class. In doing so you’ll find your inner strength and learn to share it with others. In Barre Fight teacher training, you’ll learn how to teach SALT's signature Barre Fight format, proper alignment, basic anatomy, and how to confidently guide a group through a safe and fun workout. BFTT is designed for trainers of all skill levels. Whether it's your first time teacher a class or your a season fitness professional, you will gain valuable knowledge and experience. Not interested in working as a trainer? Not a problem! Some of our strongest clients take this program as a way to intensify their personal workout. 10 CLASSES, 3 WORKSHOPS, AND LOTS OF SALT! 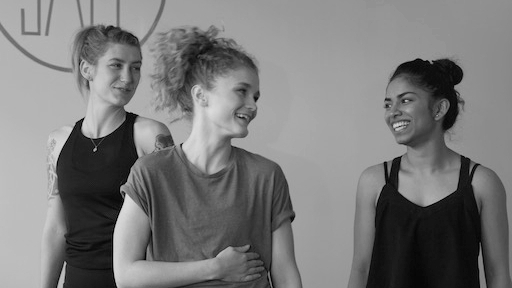 Barre Fight Teacher Training is 30 hours over four weeks, This includes one weekend intensive, one optional follow up workshop, ten Barre Fight classes, and two class observations. Training is lead by SALT founder Melissa B. and head trainer Brittany C. Together they will provide you with the support you need to succeed! Just like class itself, Barre Fight Teacher Training will not be easy. Come ready to sweat, push yourself outside of your comfort zone, and have a ton of fun! Those interested in teaching Barre Fight after training will have the option to audition in person or via video. My legs were shaking, my arms were sore and I was immediately hooked! Early last year, I wandered by the SALT studio. Interested in what it had to offer, I signed up for my first class. After class, my legs were shaking, my arms were sore and I was immediately hooked. Six months later, I heard that there was going to be a teacher training for Barre Fight. I thought it would be a good opportunity to learn the in’s and out’s of a Barre Fight class. That was exactly what I got! From proper form to sequencing and the importance of staying on the beat, I had a whole new appreciation for a Barre Fight. On top of that, I was able to meet new people and become a part of an amazing community of trainers and clients. I would highly recommend it for all clients who want to teach or develop a stronger practice. The only trick is just to practice, practice, practice!!! I took the BarreFight teacher training because I wanted to improve my workout techniques as well as develop an understanding of how to format and execute a group workout class. I really enjoyed the process of learning all the basic concepts and being able to perform the complete set by the end of the training. The best part of the training was that it was both fun and challenging. The material was well organized and easy to follow, the only trick is just to practice, practice, practice!!! I would definitely recommend BFTT to anyone who wants to up their BarreFight game! Ready to dive in? Fill out the form below to get started!